Thanksgiving is a pretty traditional holiday, but the rules of said tradition are not finite. 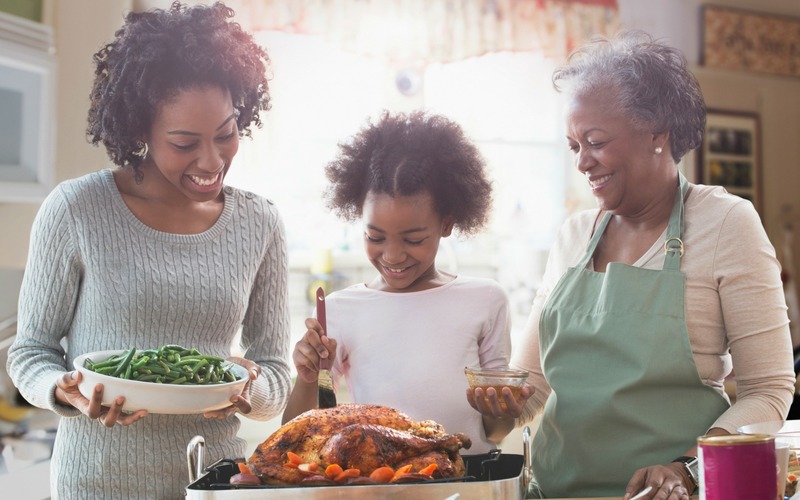 As long as you honor gratitude, togetherness and celebration, any annual Thanksgiving Day activity can become a lasting time-honored tradition in your family. For example, we know of one family whose Thanksgiving tradition takes place in the bowling alley. That’s right, they spend their Thanksgiving morning together amid arcade games, greasy fries and stinky shoes — all thanks to a grandma and grandpa who started the T-Day bowling years ago. It may not be the norm, but this Thanksgiving tradition has become a defining event in that family. Each year, more families join them as they sit back and marvel at how their web of family and friends continues to compound as time goes by. Here are nine ideas for starting your own new family traditions — and for revering the old ones. What do you remember most about Thanksgiving and the days that follow? Thanksgiving traditions can be much more than just food and recipes. By taking stock of what ways your childhood traditions symbolize particular values — such as abundance, generosity, the importance of family — you can decide what you would like to keep the same, and what you would like to differently. Write “five things I love about my family and friends” and keep it out on the table during your Thanksgiving celebration. Each guest can come and record thoughts and insights. Other great themes to try are “five things I’m thanksful for” or “five wishes for my family and friends.” An even simpler approach would be to put one sheet of cardstock out for each year — and combine them together over the years in a Thanksgiving Gratitude Scrapbook. Each night, a family member can share something that they are grateful for. Share the highlights of this family tradition at the dinner table on Thanksgiving Day. Before the Thanksgiving meal, everyone stands and holds hands in a circle. Guests each take a turn sharing what they are grateful for. Or — if your guests are on the shy side — ask everyone to write down their blessings on a piece of paper, which you can read before or after dinner. Provide fabric markers where guests can record their “gratitudes” or special prayers for the year ahead. Ask your guests to sign and date each message, as you’ll be using the same tablecloth year after year. Check out Pinterest for an endless supply of Thanksgiving craft how-tos, or try making these adorable turkeys and Pilgrims made out of Oreos — they double nicely as place card holders on your Thanksgiving Day table. The video below also has a ton of amazing ideas for Thanksgiving decorations that simple enough so kids can help, too. Purchase an apron or a t-shirt or a gift album with sentiments of thanks from each guest. Present the gift after dinner. Get together with your family and decide on a person or a group in your community who could use an extra pat on the back — firefighters, soldiers, police officers all fit the bill. Put together a special plate of goodies and deliver it (or pack it up for shipping) as a family. After the meal, record everyone’s favorite activities. Appoint one person to be the scribe — or ask everyone to jot down a few thoughts. And don’t forget to take lots of photos. When you’re planning next year’s festivities, reflect back on the book to make sure and repeat the events everyone enjoyed the most. Originally published October 2009. Updated November 2016.